The title is misleading. I am not offering a definitive list of steps (they may not even be in the right order) to set up a think tank. Instead, this post presents advice that could be considered when trying to set up a new think tank. Why this post? The simple answer is that we need more think tanks. Few developing countries have enough policy research institutes to help address the challenges they face. Instead, and because of this small think tank community, they have to rely on policy ideas coming from abroad -often from the think tanks, research centres and consultancies set up in developed countries to lobby and influence international aid agencies. Also, with only a handful of policy research organisations to produce research and policy advice, policymakers and the public cannot be expected to be well-informed. The few think tanks that some very poor countries have follow very traditional business models that make them expensive and inflexible. Recent funding cuts from the African Capacity Building Foundation (ACBF) have placed many economic policy think tanks in jeopardy. Even when new think tanks are set up, they tend to follow the same model and therefore are hard to ‘sell’ to existing or new funders. Who would want to finance a new think tank if the bill is close to a million US dollars? If it means renting or buying an office, furnishing it, staffing it with lots of administrative staff (as well as cleaners and chauffeurs), hiring expensive senior researchers with lots of demands, and then wait for months or years before the first outputs start coming out of the think tank, who would have the patience? It is time to think of a new model for think tanks. One that takes full advantage of new digital tools and resources and some of the best practice from more established think tanks across the world. This, I believe, goes beyond new tools to do old things. It means thinking of entirely new business models: new ways of delivering the same (or more) value to society. Do you want to set up a think tank? ‘Gets’ think tanks -isn’t just a subject matter expert but is also a good communicator, networker, and manager; or at least has an appreciation for all four. Has good networks -which do not have to be all-encompassing. It might be enough if they have good networks in academia or in politics. But they have to be able to offer access to the right people (even if the intention is to start small). Must have imagination -to think about alternative business models, to find the problems (and articulate them) that nobody else has found, to translate policy problems into research projects, etc. Who can mobilise resources -sure, money, but mostly people to join him or her. Is ready to commit to a significant period of work- at least 5 years of work -think tanks are not set up over night. Also, Advice to Think Tank Startup: do not do it alone. And think in terms of problems to be solved: A few initiatives, not many projects, may be the secret. Why not, too, find policy areas that are under-studied? For instance, middle class concerns. Think tanks in developing countries, funded by foreign Aid donors and agencies, tend to focus on what is often termed ‘pro-poor issues’ and shy away from more mainstream and middle class concerns (e.g. they focus on primary education but not on tertiary education). However, as countries and their middle classes grow, their concerns need to be addressed, too. A single-issue think tank is also a good alternative. It may help you find “natural” funders and audiences. I’ve been promoting the idea of think tanks focused on sectors. Who you work with will have an effect on the original scope of the think tank. In the end, it will all come down to who you may or may not bring along to the organisation. Think tanks are political actors -let’s not pretend they are not. They need a polity. This may be local, sub-national, national, regional, or even global. Each will demand a different governance arrangement, skills, and strategy. Do not overlook this issue. Part of this step is to map out ‘the competition’. This is not so that you may avoid topics or policy audiences that are already being served by another organisation -we want more debate, after all. This is so you know who you will have to work with and that you begin to make (or burn) bridges strategically. International audiences are not necessarily harder than domestic ones. In Africa, I’ve found that new think tanks are seeking out regional or international political spaces as a way of avoiding the challenges involved in domestic politics -especially in contexts where the policy space is rapidly closing down. The very local space is also undeserved. At the PODER Awards to the best Peruvian think tanks we have found a significant difference between the national and the local politics: the former is much better served by think tanks than the latter. In counties like Indonesia, India and Argentina, local think tanks exist to serve sub-national policy communities. You could start by studying and supporting policy decisions at the municipal level (maybe the municipality where the think tank is based), then move up to the city level and then aim for national politics. Small is no less interesting nor less relevant. Alternatively, you could consider the IPPR approach of opening a sub-national operation: IPPR and IPPR North. A big part of the discussion in the previous two points will focus on whether the new think tank will have an identifiable ideology or not. Many think tanks today attempt to present themselves as neutral, evidence-based, technocratic, independent, etc. But however hard the try all think tanks and all people will have and ideological stance -even if it is not immediately identifiable. Ideology, after all, is nothing more than a particular set of values. Everyone has them. And every time that a think tank recommends a course of action it is making use of values: evidence does not tell us what do do. It is helpful for think tanks to define, ex-ante, their core values. These do not need to be too specific but should offer a sense of where they might fall across the political spectrum. These may be rather simple (e.g. all for liberalisation) or more complex (e.g. liberal on social issue but more conservative on political and moderate on the economy). Being open about the think tank’s core value will help to get support from funders and even draw the attention of future researchers. Board members: not just subject matter experts, also people who know about think tanks and about the various aspects of their work: management, communications, fundraising, etc. I would recommend avoiding people who won’t be able to dedicate enough time to support the think tank -big names are not enough. Researchers, particularly a pool of possible research associates who you will not have to employ but can appeal to for support with fundraising, contacts, etc. Funders: ideally domestic (don’t rely too much on foreign funders) and committed to the values of the centre. Early on, it is worth thinking about a wish list of these three. CIPPEC’s founding director, Nicolás Ducoté, told of the days when the think tank was founded. He said that they spend quite some time meeting potential supporters telling them about the think tank and asking for name of people who may be interested to learn more about it. They didn’t ask for money. Slowly, funders came around. Some think tanks want to start big. They seek lots of funds to plan and deliver huge research projects that they hope will earn them top marks and credentials. This is one approach but the sources of funding for it are quickly drying up and, in any case, few funders re willing to wait months for the first outputs. The problem is that this usually involves going away with lots of money for 6 months to a year to deliver a think book or report that may be worth every penny but isn’t enough to make a difference or draw anybody’s attention. Then launching the briefs in an events series (one for each brief), plus accompanying blogs, videos, and media coverage. Large synthesis and annual reports: There is nothing like a big report to draw the attention of lots of very important people. Putting together large systematic reviews on key policy questions and/or producing a high profile annual report on ‘the state of a sector or challenge’ can be a great way of launching a think tanks. As in the case of the ‘package of outputs’ approach, these reports can (must) be accompanied by a package of other outputs. Initiatives: The Center for Global Development has written about this approach that remains one of the most interesting ones; but may demand more management competence than you may think. In my view, new think tanks should avoid, at all costs, starting by working on one large very academic research project that will demand that they ‘go away’ for months or years before they can deliver their first output. Other approaches are possible, too, of course.Gerard Ralphs documents these in his work on think tank business models: Think tank business models: The business of academia and politics. Ya Li, from the Beijing Institute of Technology, has written about a new approach: The deliberative think tank: a function or an entirely new model? Working with associates: they are probably employed somewhere else and therefore bring their credibility and expertise to the new organisation, plus, they won’t cost the think tank much (or anything). It may be harder to plan and coordinate things with them, however. Combining a few senior researchers (associates, for instance) with young (and relatively inexpensive) research assistants: some of the best work in think tanks is done by young researchers keen to make a name for themselves after university and work with well known policy entrepreneurs in think tanks. Young research assistants may not stay long but they can be relied on to work hard. Furthermore, they will be more likely to know how to take full advantage of all that digital tools have to offer. Work in partnership: many think tanks and academic research centres are not very good at (or do not want to) communicating their research. You may be able to offer them a ‘service’ by taking care of this while they focus on their research. It will be hard to develop a cohesive agenda for your think tank but it should guarantee good content and networks. Combine consultancy with thinktankery: some think tanks try to combine income generating research consultancy with think tank type communication and outreach work. This works most of the time but it can be challenging to maintain the right balance for the organisation. Under this model, the think tank could attract consultants interesting in playing a more public role in society by allowing them to raise their own income in exchange for an overhead charge that pays for central costs. Whatever the approach, a new think tank should try to keep their initial staffing costs low and flexible. You should not be forced to close because you cannot pay salaries. Subcontracts, partnerships, short-term consultancy arrangements, project specific contracts, and other contractual arrangements are preferred to full-employment-cost contracts. Furthermore, you should not limit your search to close contacts and personal networks. The market of think tank experts is increasingly global. 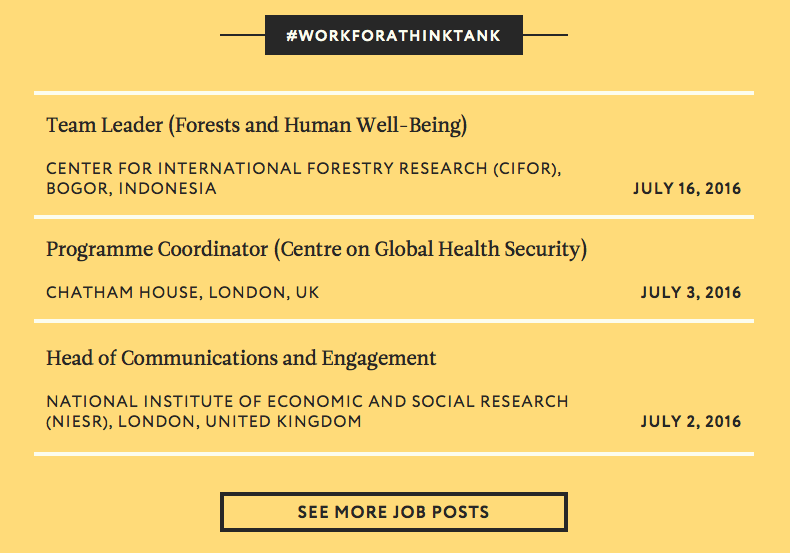 On Think Tanks’ Jobsboard offers an opportunity to hire thinktankers from all over the world. A board or governing body that is independent from the management of the think tank and that is ultimately responsible for its long term vision. A competent executive direction including a competent manager at its centre. A tier of ‘senior’ managers or researchers that is responsible for oversight of the three main aspects of any think tank’s work: research, communications, and management. How will researchers be associated to the think tank: permanent staff, associates, etc? To keep costs low, I would start with a small group of senior research associates who bring their own expertise and work (form other organisations, for example) and who may form the basis of a senior management team, each leading on a policy issue, for instance. They do not have to be full time members of staff and therefore would not be a cost on the new think tank. I would include a senior (in terms of responsibility at least) communications manager right from the start. Do not be fooled by the idea that you can wait to deal with communications later on. Also relevant is that your governance arrangement will have to consider the legal framework in your country. What is the best type of organisation for your objectives? Should you be an NGO, an association, a club, a project within another organisation, a private sector company, etc? You should seek legal advice to make this decision. Whatever you decide, do not leave this to later. There are other models that can be explored, too. A think tank may emerge as a project or an organisation within a university, they can be affiliated to a larger institution ( a ministry or even a Church), they could be entirely digital (see below). Some think tanks choose to register in countries where civil society organisations enjoy a more welcoming environment and other choose to set themselves up as for-profits. The boundary of what is and isn’t a think tank is porous and flexible. A decent office could cost about USD1,000 plus utilities in a city like Lima (where I am writing this from). This is what a young but very competent research assistant would cost, too. What would be more useful for the think tank? People. People are always more important than offices. It is possible to run a think tank remotely. Laptops and public wifi make it possible for teams to meet in coffee places and work together on a project. Space for public meetings can be rented; and associates of the think tank may offer it for free in their own institutions. There is no need for servers; DropBox or GoogleDrive will do for intranets, Google Apps can wort out all email needs, and there are lots of other tools that can be used to manage teams, store and share documents, deal with finances and taxes, etc. Communications, of course, can be entirely digital, both in relation to the team as well as with the think tank’s audiences. And even research can be supported by digital tools. This is all part of a discussion blog I wrote for an idea for a Think Tank Hub. If necessary, you should not wait until you have funds to start. By taking advantage of a light and flexible governance structure and a high visibility approach (like the package of outputs one) you should be able to start with at least some outputs. Publish while you read: If you and your partners are interested in a topic you are likely to read about it. Every time you read a paper or book or article, post a short review of it on the new think tank’s blog/website. Each post can be simply tagged under your think tank’s key policy topics; e.g. Education, Health, etc. After a while, the site will contain an important repository of content on these issues and you may be able to put together a ‘background post’ that summarises or draws from these previous posts from the literature. You can add an ‘opinion post’ as well. These are all outputs that ‘feel’ more like the outputs of think tanks. Publish other people’s ideas if you agree with them: Using content produced by your board members, associates, and even third parties is a perfectly valid way of ‘producing content’. Think tanks often miss the opportunity to be present in policy debates because they want to wait until ‘they’ have something to say. Windows of opportunity can open at any time and if a think tank is not ready to say something it will miss it altogether. There is nothing wrong with saying: “As so and so said, the best solution is to …”. Produce events and create new content: Producing an event series can be a very cost effective way of drawing attention to your organisation and producing new content. There are many free venues in town: universities often lend empty rooms to their alumni, staff or students (your researchers may be university staff or still be students). You could co-organise with another think tank (if you do all the work they may be happy to lend you the venue). Even coffee shops, restaurants and other businesses may allow you to use their venues in exchange for paying customers. Be creative. Nobody expects a lavish hotel or conference venue for an event to talk about policy and research. Events, also, do not have to be too elaborate and full of pomp. Three chairs for a small panel and room for 25-50 people should be enough. There is no need to offer expensive food or fancy drinks. Attendants, if they go to an event, go for the ideas, not for the food. Keep them simple and to the point (your point -i.e. as made in your reports and briefs): make sure the speakers are briefed, that they only talk a few minutes, and that there is always time for the public to engage. Use the events as a way of producing new content: 1) webstream and record the event (and upload right away) -do not worry too much about film quality, use your phone or the webcam on your computer; 2) live tweet before, during and after the event, 3) record audio and upload as a podcast; 3) upload any presentations or documents shared; 4) write an event report/blog post; 5) interview the panelists for 1-2 minute films (on your phone, it is enough); 6) interview members of the audience; 7) register those in attendance and add to your data-base; etc. You can then publish all of this over the course of weeks if not months while you and your researchers are busy tackling some other policy issue. Use research you have done before: New think tanks sometimes say that they have little need for a website because they have little to publish; or that starting with an event is not possible because they do not have any research to present. This is not exactly true. Think tanks are all about their people and it is unlikely that the people making up a new think tank (however young they are) do not have any previous work and ideas -published or not. All of this can and should be used by the new think tank. You do not have to take credit for it (say, if a paper was written by the director or a researcher while working for another think tank do not delete their logo) but can certainly republish it and add it to the list of studies written by the think tank’s staff. An event, too, can be organised to ‘broadcast’ the guests’ work via the new think tank’s YouTube channel or website. You are not stealing; you are helping to give ‘old’ researcher a longer shelf life. And this is great. None of these things cost too much (in fact, there are free digital tools for every one of these tasks). They can be done ‘on the side’ to other work and do not demand great skills. But they will go a long way in attracting the attention of funders when you do go looking for funds. And more importantly, your think tank’s URL will not lead to a “under construction” site that will disqualify you from the start. Before you start you will face a close to existential question: are we ready to publish? In other words, are we ready to say what we think? Unless your outputs are of such a terrible quality that getting to this point has been an indisputable miracle then my advice is to go for it. Your outputs may not be perfectly diagrammed and they may have typos but you can always publish new versions (digitally, of course) and by repeating the process you will get better soon. And your opinions are just that; opinions. Think tanks do not publish ‘the truth’, they publish opinions (some more informed that others): ideas and arguments that are mostly personal value judgements on the basis of a little bit of (available) fact. It is almost guaranteed that someone will disagree with what you have to say. And by the same logic, there will always be someone who agrees with you. And the best thing that can happen is that an important and visible person disagrees with you in public. This will only give you immediate credibility which, if you are smart, you will take advantage of with your very savvy communications strategy. You do not need a long and complex strategic plan with lots of objectives and indicators to know what to do. It may be enough to have a clear vision and mission, define a few lines of action, and get on with it. A short strategy or plan will do.